Professor Lloyd Cycloyd, a crazy scientist who escaped from an instituition, accidentally discovers the Turtles’ lair. He sees Donatello testing out one of his new inventions, a time stopper. This device can freeze anything in its tracks, making time stop for them, but not around them. The Professor thinks he can use this mechanism and sneaks in and steals it. When the Turtles go after him, the mad doctor zaps them with the machine, freezing them in mid air. He then sets out on a crime spree using Donatello’s invention. Back at the lair, the Turtles are still frozen when Splinter walks in on them. As he is trying to figure out what he is going to do, they recover. At first, the Turtles don’t realize what has happend to them, but it all starts coming back soon enough. With April’s help, Donatello finds out where the Professor lives and heads out to retrieve his time stopper. The Professor sees Donatello coming. When Don enters the house, the Professor zaps him with the time stopper. Once Donatello comes to, he finds himself suspended over a vat of acid. Cycloyd has Donatello rigged to a door so that when the other Turtles come to rescue him, he will be dropped in the acid! The other Turtles do come to rescue Donatello and use the door that has been rigged by the psycho Cycloyd. 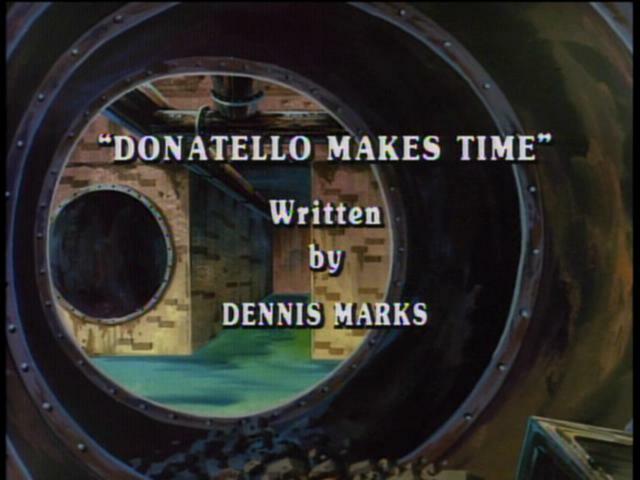 Fortunately, the Professor leaves the time stopper near the door, allowing Leonardo to use it on Donatello just as he is falling into the acid. This freezes Don-san in mid air and allows the other Turtles to rescue him. Afterwards, the TMNT find the Professor and bring him to the police. After careful consideration, Raphael, Michaelangelo and Leonardo think it is best if Donatello gets rid of his invention. Before Donatello can answer, Raphael drops it, breaking it into little pieces.